Discussion What are your 2019 LPGA Season (Fun) Predictions & Thoughts? What are your 2019 LPGA Season (Fun) Predictions & Thoughts? I'm curious to know how you all answer the following questions. 1. Pick 5 winners from 2018 that will win again in 2019. It may be easier to pick players that will not win in 2019, but if you limit it to 5, the names you leave off this list makes it difficult. 2. Pick 4 players that will either capture their second win or win again after not winning for 2 or more years. 3. Pick 3 players that you believe will capture their 1st win on the LPGA Tour this season. 4. What 3 players are you rooting for winning their first tournament on the LPGA Tour? Megan Khang should be in the other 1st win list, but I don't recall her going through the "holding the lead at the end of a round" and "being in a final group in the last round" stages that players tend to go through before winning. I initially thought Aditi Ashok didn't have a good sophomore campaign, but examing the results, her 2018 season was better than her 2017. Stackhouse could still be a season away. 5. What players would you like to see team up for the Dow Great Lakes Bay Invitational? Pick 4 Teams. Minjee and Karrie is a nice multi generational pairing. Nasa and "The Rocket". I doubt it would happen. Yin, Joh and Jenny Money would probably be very entertaining. I'd imagine if you are the top player or one of the most respected players from your country as Nasa, Shanshan and Pornanong are, one of your countrymates is probably eager to play with you. Which is perfectly fine in year 1 of a team event and makes these pairings I selected unlikely. Ponanong and Chella would be a fashion pick and they both play Volvik. 6. What players do you think will win their 1st Major Championship this season? Pick 3. 7. Which events are you looking forward to the most this season? Pick 4. I'm interested in seeing how the back to back majors plays out. 8. Which players are your top 5 picks to win Player of the Year? 9. Which players are your top 4 picks to win Rookie of the Year? or Pick your own question. I'm not that familiar with this years class of rookies. I'm hoping for a third major (preferably one they don't already have) for each of So Yeon Ryu and Ingee Chun (maybe a longer shot for Chun but hope the IL Crown and win late last year boosts her confidence). 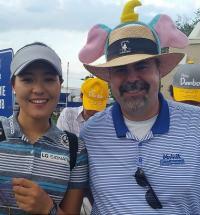 Interested in a) can Minjee Lee win multiple times / a major (very young and keeps improving. Also not Lexi/Ariya long but has 10 yards on most of the players) and b) can Lydia Ko get back to being a top 5 player (not necessarily 2014 - 1H 2016 pace) or is a season like 2018 going to be what's normal for her going forward (which is still very good). Not really answering your questions, but here are some things i look forward to among a great many. 1) Can Hannah Green recapture the form that got her into third place in the 2018 Aus Open? 2) The Great Haru! is she back? She is so underestimated, I think, for a 3 time career LPGA winner. 3) What will Hye Jin Choi's progress be like? I predict Carlotta Ciganda wins an event (hardly a bold prediction!). Brooke, Lydia, Ariya, Lexi, Minjee and Sung Hyun are inherently fascinating and that goes without saying. Any one of these has the capability to step up a gear, so i will be watching to see if any of them do. Jeong Eun should win in her first two seasons. Megan and Muni have little chance, but I'd like to see them pull through. Hye Jin plays on the KLPGA. Are you referring to Jeong Eun (Lucky 6), or are you talking about Hye Jin's play at the USWO? I have a feeling the USA, lead by the likes of Michelle and possibly Muni "Lilly" He, will be resurgent this year. I wasn't sure what tour she'd be on, so thanks for that. If she is the KLPGA she will still probably play the British and US Opens. last year she played the Australian Open, so i am hoping she tees it up again next week! ​F it, coming off the bag, it's Brooke and Brittany Henderson! I'm only going to list the KPMG, because I think So Yeon is going to be going full tilt to make up for her 17th water shot last year. Lol. That didn't take long.